Questions about why early-grades literacy instruction is falling short in the United States have been making national news recently. A key concern centers on why evidence-based practices are not being implemented in classrooms despite strong evidence of what works for learners. I gained some perspective on this problem, and potential solutions, when I traveled to Liberia to observe the USAID Read Liberia activity this past fall. I work for RTI International’s Center for Education Services that supports the implementation of evidence-based practices in U.S schools, and I was interested to learn how Read Liberia uses teacher professional development and coaching to improve literacy instruction. I came away impressed by how the design of Read Liberia applies comprehensive supports to help teachers implement sound literacy instruction in the classroom. The following are insights I gained and potential implications for the design of education programs targeting large-scale change. 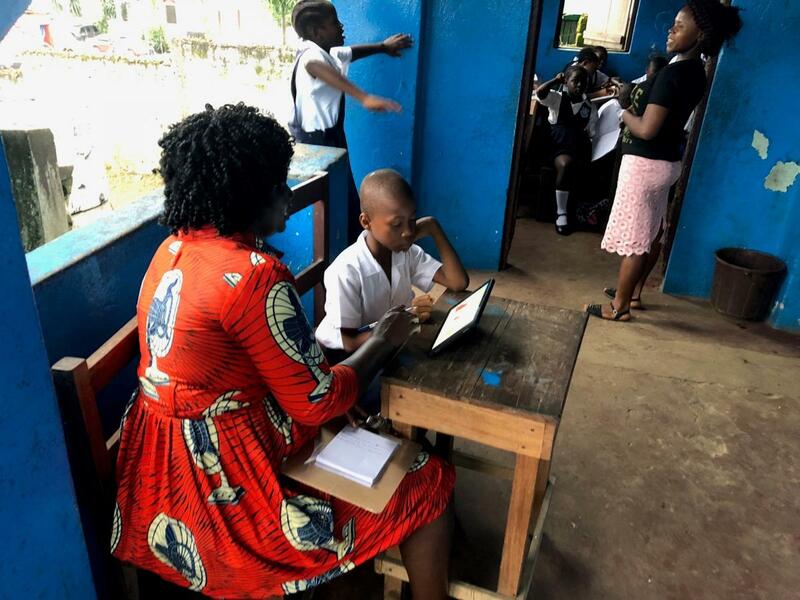 - Equipped teachers—Read Liberia provides evidence-based instructional materials to teachers and high-quality texts to their students to support literacy instruction. I visited at the beginning of the school year, also the end of the rainy season. Flooding in Monrovia was so bad one afternoon that it took three hours to travel a few miles from the Read Liberia office to a local library and back, and many rural roads were nearly impassable. Yet, the Read Liberia staff was in high gear working to get curricular materials delivered to all 640 primary schools in the program. This evidence-based curriculum allows teachers who lack essential instructional knowledge and skills to facilitate student learning while they work to develop their practice through professional development and coaching. - Dedicated coaches—Central to the Read Liberia model, a cadre of instructional coaches lead professional development and provide follow-up coaching to support implementation in the field. What impressed me about these coaches is similar to many coaches I work with in the United States: they are passionate about student learning and helping teachers grow. I watched these coaches use data gathered during classroom observations to provide timely feedback to teachers. I also saw them coteaching, answering teachers’ questions about literacy instruction, and guiding teachers in reflection and goal-setting to improve instruction, all strategies designed to support teacher growth. - Engaged students—Although class sizes in Liberia tend to be quite large (sometimes 75–90 students in a class) with traditional teacher-centered instruction, students in Read Liberia classrooms held partner discussions about texts, created manipulatives to support the learning of phonics, and sang and danced as teachers guided them in brain breaks. - Informed leadership—School, district, and even national education leaders attend Read Liberia trainings along with coaches and teachers. Every leader I spoke with understood what literacy instruction should look and sound like in the Read Liberia program, and each understood their role in supporting the program and communicating expectations. One official at the Ministry of Education told me he appreciated the Read Liberia program so much that he uses strategies he learned with his own children. - Partnership—The Read Liberia program engages partners at multiple levels to support success and long-term sustainability. This approach includes a strong partnership with the Ministry of Education focused on policy that supports national literacy goals. It also includes community outreach at the local level focused on educating parents about Read Liberia's goals and provides strategies to increase students’ reading outside of class. Read Liberia’s design is informed by research and extensive lessons learned from past literacy projects across Africa, including the EGRA Plus program and the Liberia Teacher Training Program (LTTP). Read Liberia’s interventions combine evidence-based early-literacy instructional practices with multiple supports for the teachers implementing those practices, including extended teacher professional development, follow-up coaching, and high-quality curriculum materials to support instruction. It also uses data and feedback at the classroom level to improve practice, and at the program level for monitoring and evaluation. Community engagement components enhance local support, while intensive collaboration with the Liberian Ministry of Education helps to create policies, systems, and structures needed to refine and implement the program at scale. Although Read Liberia is only in the second of five years of implementation, a similar program called Tusome is yielding strong outcomes in Kenya (see https://www.cgdev.org/blog/bringing-literacy-project-scale-has-kenya-found-holy-grail). 1. Evidence-based resources: How can evidence-based program materials support effective implementation in the short term while long-term capacity-building efforts are on-going? 2. Coaching: What tools, training, and support will maximize coach effectiveness in the field as coaches work to support implementation and help teachers improve practice? 3. Leadership: How can leaders become well informed about program content to effectively support implementation? 4. Data: How and which data will be used to provide useful feedback to those implementing the program on the ground and to inform decision-making by administrators? 5. Stakeholder input: How might the input of those implementing and receiving programs strengthen program design? The passion and commitment of the Liberian coaches I met continues to stay with me, as does the dedication of the teachers I met and the enthusiasm of the students with whom they work. And while it does not take a trip to Africa to learn about good program design, one of my key takeaways is a reminder that good design is informed design. Whether we partner to improve literacy, numeracy, or other student outcomes, educators deserve well-designed, contextualized programs that support engaged learning and create lasting impact.